Wonderful Wednesday was all about the endocrine system today. 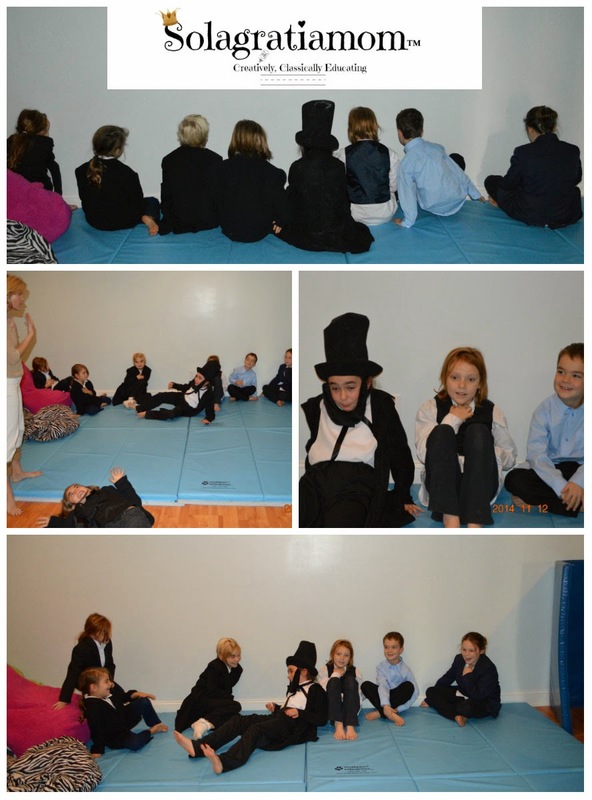 The kids got the fright of their lives to start our day and then we ended our day with an Abraham Lincoln themed snack and review game, with fun learning in between. We had some special guests today too - always love when a Grandparent (or two!) can come join our day! 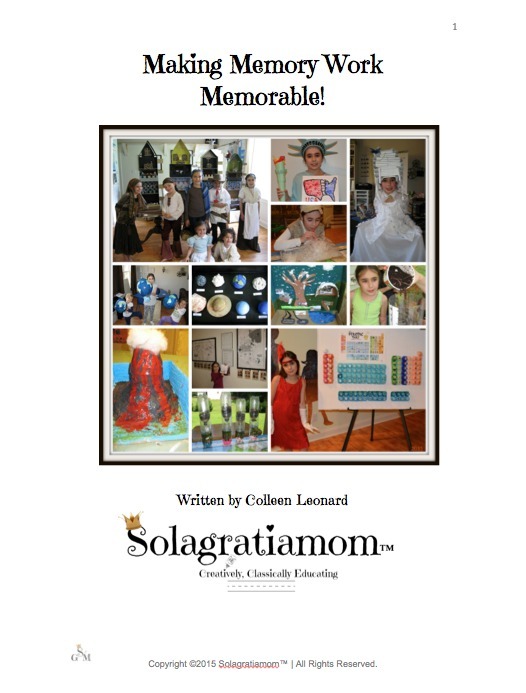 To start off, I set the stage with having the kids sit in the dark with their backs to me and eyes closed. They were talked to with a soothing voice telling them to relax their bodies and imagine themselves in a nicely wooded area with beautiful flowers and warm temperatures greeting them. Then we moved into a not so warm and inviting place as the story took them to a home that appeared occupied but they went on a search to find the person living there. As they searched, there were unexpected noises and then some weird sensations they were told to feel (like a damp wet basement wall) as they made their way down the stairs to see what they would find, then all of a sudden AAAAAAAAAAAAAHHHHHH!!!! a LOUD scream was let out by one of our Moms when cued! The kids about jumped out of their skin! They got a great beginning lesson in the job of our adrenal glands. We talked about what their bodies were feeling (sweaty palms, fast heart beat, shaky hands and fear). Then we discussed how the body uses adrenaline and noradrenaline (hormones to cause a chemical reaction in our body) to provoke a "fight or flight" response in the body to perceived danger. I do believe it will NOT be a lesson they soon forget! After our frightful introduction, we had to settle the kids back down, so I had them watch an endocrine system video that gave an overview of this body system. It's from Kids Health. 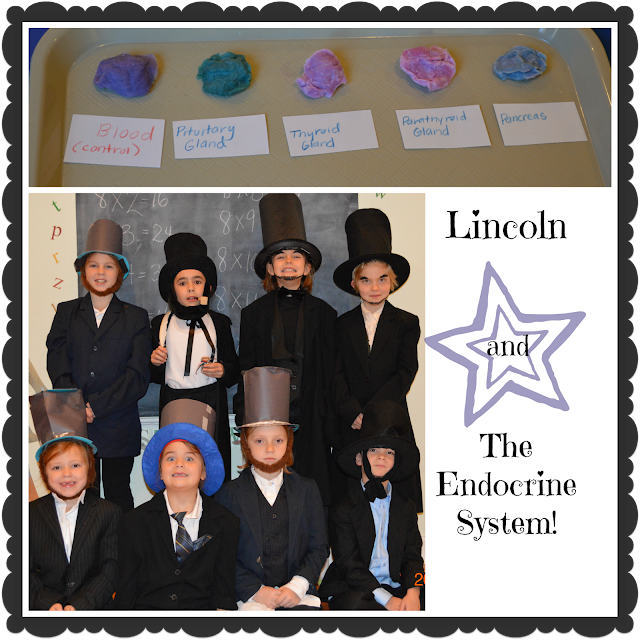 Next we discussed the different parts of the endocrine system they had just watched. We identified what those parts were and what their function or purpose was in the body. 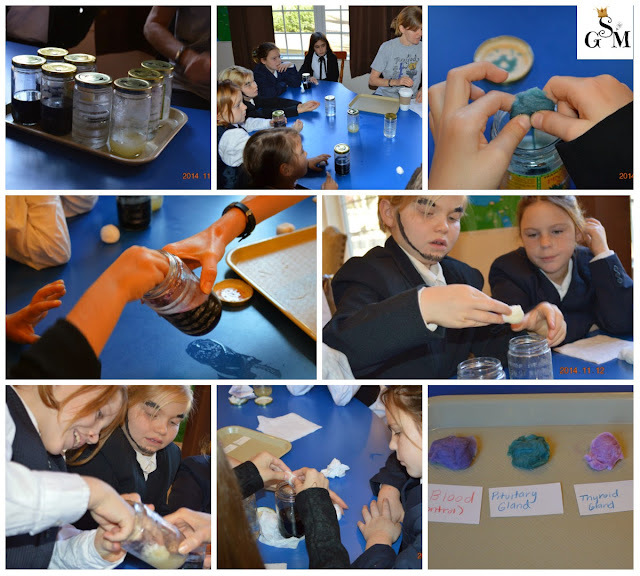 After that was discussed, the kids were told we would do a demonstration of what the various glands do to change the chemistry of the body when they are activated. We used cabbage water to be the body and then had jars of baking soda/water, vinegar, lemon juice and light baking soda/water. We first dipped a cotton ball into the cabbage water to be a "control" color for us. Then one by one we pretended each various solution was one gland or another and they would dip their cotton ball in it, squeeze it out into the cabbage water (body) and then dip a clean cotton ball in the mixed solution to see how that "hormone" excreted, changed the "body's" chemistry (in our case, color of the water). Once that activity was completed, we covered some vocabulary words related to the endocrine system and specifically honed in on duct and ductless glands. I used a sponge and pitcher of water to demonstrate the difference between duct and ductless glands. The holes in the sponge represented the ducts and then the sponge was placed into the water and then squeezed out and then placed in the water and just allowed to drip slowly on it's own. 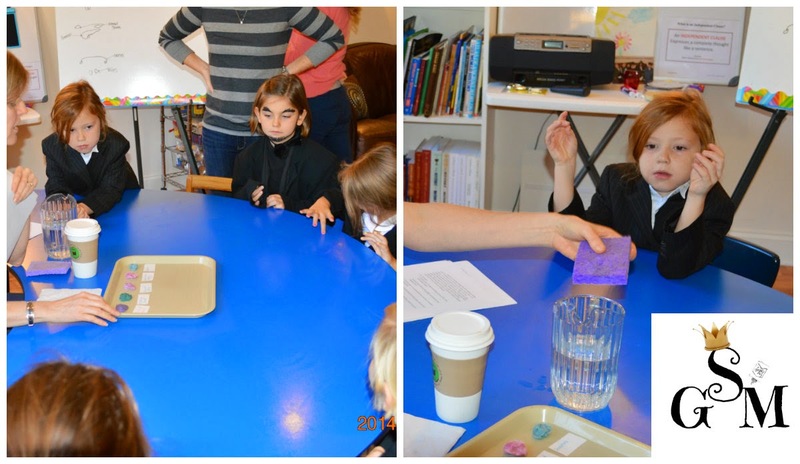 We compared how duct and ductless glands work with these two demonstrated activities with the sponge. For a change of pace, I had the kids take giant pieces of paper and then they were told on one side to draw a picture of the gland and label it's name. On the other side of the paper, they were told to draw a picture of something that would help them remember what it's job was within the body (think rebus). To give an example- they may draw the parathyroid gland and then on the other side, draw a milk jug with the word calcium on it to represent the parathyroid's job of calcium uptake and bone strength. 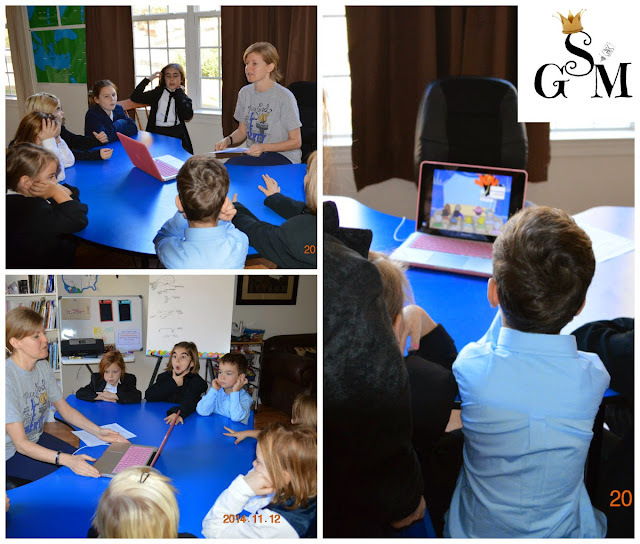 We worked our way through each gland and each function the gland performed within the body. The kids used their imagination and had to really think through what the gland did and how they could represent that in a drawing. 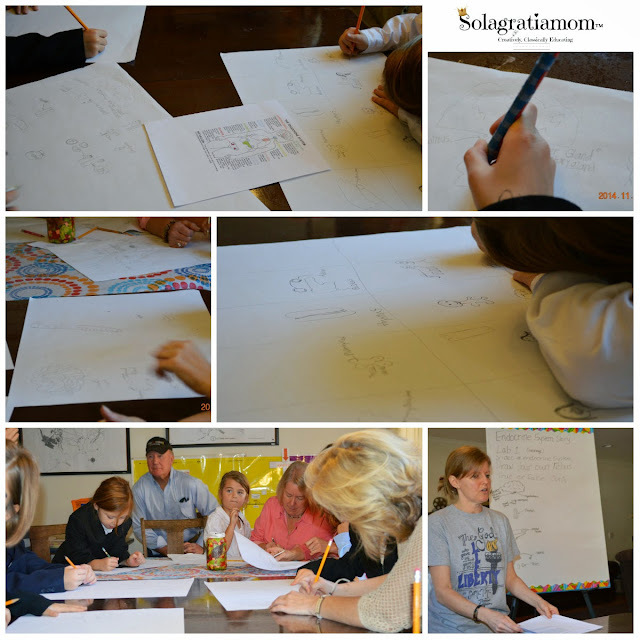 It was a good activity for them to really process the information they had learned today. Once this was completed I announced a test! This was a true or false test that I read out loud to them. It had various questions that had to do with the endocrine system and they had to think through what was being said and whether it was true or not. An example was "Your pituitary gland could make you grow 9 feet tall!" (T) and "Your parathyroid regulates your blood's sugar." (F). It was a fun quiz and just further helped them process what they learned today. 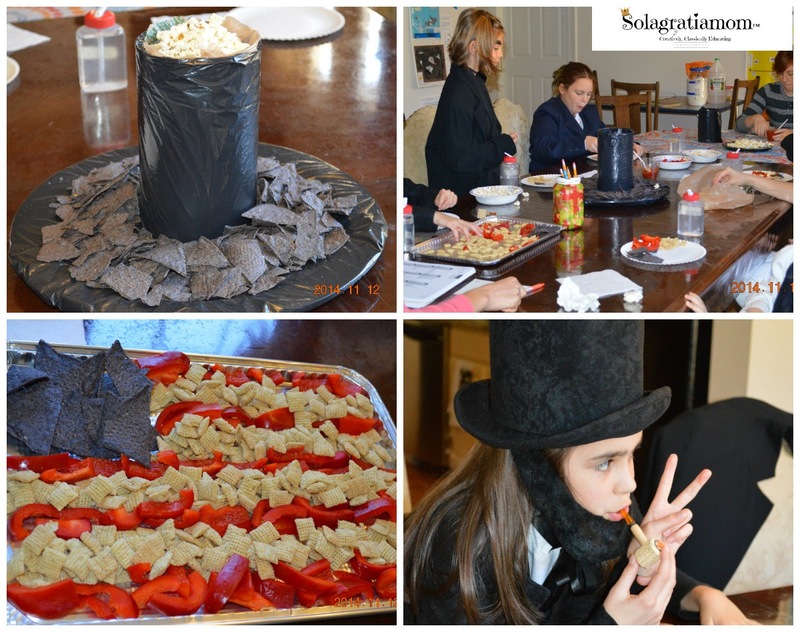 Last but not least, we had a fantastically creative snack by one of our Moms - theme was Abraham Lincoln! She did a super job! The kids munched away, while they played a dice game to review their memory work. It was a Wonderful Wednesday! I hope yours was too! Looks like a lot of fun learning took place. Visiting via Weekly Wrap Up. I'm always impressed at the costumes you make for your co-op. They make for such a great picture. Thank you for stopping by! It's super duper fun each week!